BRITISH Cycling trained Ride Leaders will guide small groups of cyclists around some of the Lake District's most scenic spots for free this summer, with the launch of a community cycling initiative, Sky Ride Local. In partnership with British Cycling and Sky, the GoLakes Travel programme will bring the initiative to the area, delivering a series of free, fun, led bike rides kicking off in May and running through to October. 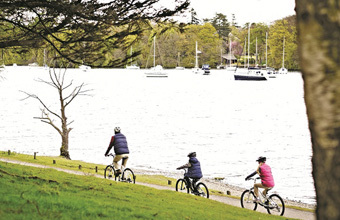 Starting points for the routes will include popular tourist hotspots such as Ambleside and Windermere, many close to bike hire points and making the most of new - and planned - cycleways being enhanced through the GoLakes Travel programme.